Bhadantācariya Buddhaghosa was a 5th century Indian Theravadin Buddhist commentator and scholar. Buddhaghosa means «Voice of the Buddha» in the Pali language. 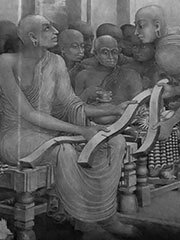 He translated extensive Sinhalese commentaries on the Pali Buddhist texts in Pali. Certain commentaries are also attributed to him, including one on the Vinaya and one on the Dhammapada that includes 305 stories for context. His Visuddhimagga (Pali, Path of Purification) is a comprehensive manual of Theravada Buddhism that is still read and studied today. The book is divided into sections on Sīla or Ethics; Samādhi or Meditation; and Pañña or Wisdom. This is a traditional division in Buddhist teachings, which suggest that ethics are essential to meditation, and that meditation is essential to developing wisdom. From the Buddhist point of view this is the «path of purification» because it purifies the mind of the defilements of greed, hatred, and delusion.